Cast Iron Gilberton Entrance Gates 3m. 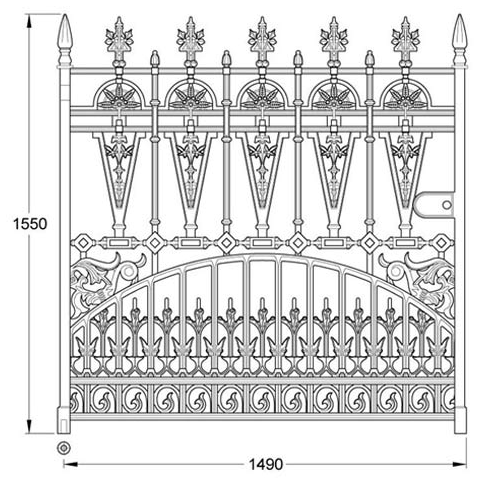 The Gilberton Collection of cast iron gates and railings is very decorative and features intricate detail. This design was taken from an original gate we discovered and the resulting collection has proved to be one of our most popular. They can be used with automatic gate opening units and prove more durable than wrought iron or mild steel gates. Our products are very heavy and as such even with the utmost care and diligence it is quite conceivable that they will get scraped and scratched during installation and transportation. If the gates were supplied painted this would compromise the final finish. We therefore supply them with a zinc base primer and oil based undercoat ready for final painting after installation. Please note: GA001 gate posts supplied separately. Due to the weight and size of this product shipping can not be calculated on our website. Please select STORE PICK UP/WALK IN and we will contact you with shipping cost after you have completed your order.